It is the first Friday of the month this week, which means it’s Fish and Chip Friday! 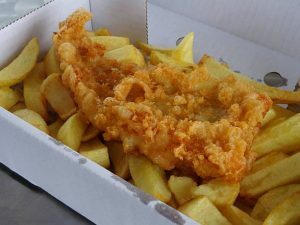 Plans have been put in place to ensure service will begin at 4:30PM and there will be a vegetarian option of battered halloumi, in addition to the usual chip shop favourites. On draught at the bar will be our Green Hop GP75 Golden Ale, Pekin Pale Ale, Sebright Golden Ale and our Imperial Stout, which at 7.3% is a drink to warm the soul and keep the cold at bay! As ever with our Fish and Chip Fridays, if you can’t join us for a drink, you’re very welcome to just pick up some food to take away. We hope you’ll be able to join us. ⟵26th October – Hot Food Friday!